Around 7:00AM, our breakfast was served. We had Fish Pops, Sauteed Bitter Gourd and Fried Fish. Yummy! Perfect starter of the day before heading to our next Island Hopping Trip. After breakfast we prepped early only to find out that they are still preparing for our Lunch as we are going to have it in Manlawe Sandbar. Fair enough we decided to just enjoy the sun and wait. It was time to leave. At around 9:30AM we finally left the resort and went on an hour boat ride going to Manlawe Sandbar. We decided to play cards while in the boat. Haha! It also rained on our way but it was fine. It was almost half past 10 when we arrived in the floating cottages of Manlawe Sandbar. The water was waist deep when we arrived but we were told that this eventually turns to a sandbar in the afternoon. Different stuff are sold here. They sell different kinds of shells and fresh seaweeds. Even emperador light and fruits. Shells range from Php 5 to Php 100 depending on its size. Fresh seaweeds costs Php 20 per pack. The waist-deep water turned knee-deep and from afar the sand appeared glittering under the heat of the sun. It was beautiful! Manlawe Sandbar is one of the best here in Caramoan. Enjoying everything so much, we didn’t notice the time until we were called to have lunch in the floating cottage. Floating cottage rental costs Php 200. Another delicious food was served. We had shrimp, string beans and seaweeds. Yum! After lunch, we went straight to Cutivas Island. The way out from Manlawe going to Cutivas was a challenge for the boatmen because of the shallow water and corals around. There were times when they only used their long bamboo stick to maneuver the boat. Cutivas Island is mainly used for picnic and it’s advisable to go here during high-tide for you to enjoy and swim around. Starfish are everywhere here. From white to black to orange and gray. Big and small. Not to mention Sea Urchins. Yeah there are loads of them here. Trying to get the most out of our trip here, seven of us bravely walked our way going to Parola Island. Water wasn’t really deep however Sea Urchins (Black & White) are scattered all over the sea bed. At first it was fine as we can clearly see them in order to avoid them however as we get closer to Parola Island, water turned murky and it was suddenly chest deep which makes it even harder to avoid the Sea Urchins especially the white one. Local kids helped the girls until we finally reached the shore. It rained for a bit so we decided to rest and eat some snack. The next challenge, we thought, was how do we go back and make sure no one gets pricked by the sea urchins. Noticing locals walk their way from where we came to where we were, we decided to go the same direction. But before we did, we took a photo of ourselves with the kids who helped us. Knowing our boat won’t be able to get us because of the shallow water, we started walking and just few meters from the shore the unexpected happened. One of us got pricked by the sea urchin, both her left and right foot got pricked. There were loads of them in here. We hurriedly carried her back in the shore and called for help from the locals. We were told to immediately put vinegar or calamansi. Locals were kind enough to offer the small boat for us and bring everyone to safety (away from sea urchins) It was in batch of 2 until one of the boatman said that he can bring us all remaining four guys in one go. We thought it was fine until the boat sank far enough away from where sea urchins are found. Wrong move for the boatman but we were really thankful. Now we know how it feels when your boat is sinking. We then started walking back to Cutivas Island. Despite the big number of sea urchins and the thing that just happened everyone still managed to laugh while sipping on a fresh buko juice. After Cutivas Island, we were suppose to go back to Sabitang Laya but because of what happened, we asked the boatman to just go around so the rest of us can see the other side of the island then went straight back to the resort. Back at Candiis Island Resort, with the help of the caretaker, they gave us calamansi to aid the sea urchin sting. While trying to remedy the sting, we had Maruya (fried banana coated in flour) and soda for snack. Calamansi did help a lot! Still a bit early, we decided to hike and went to the highest point of the island to witness the sunset. It only took us roughly 15 minutes to get the peak with a help of a local guide. Now we know why there are big holes around. After tidying up, we were then summoned for the much awaited event. Dinner Time! 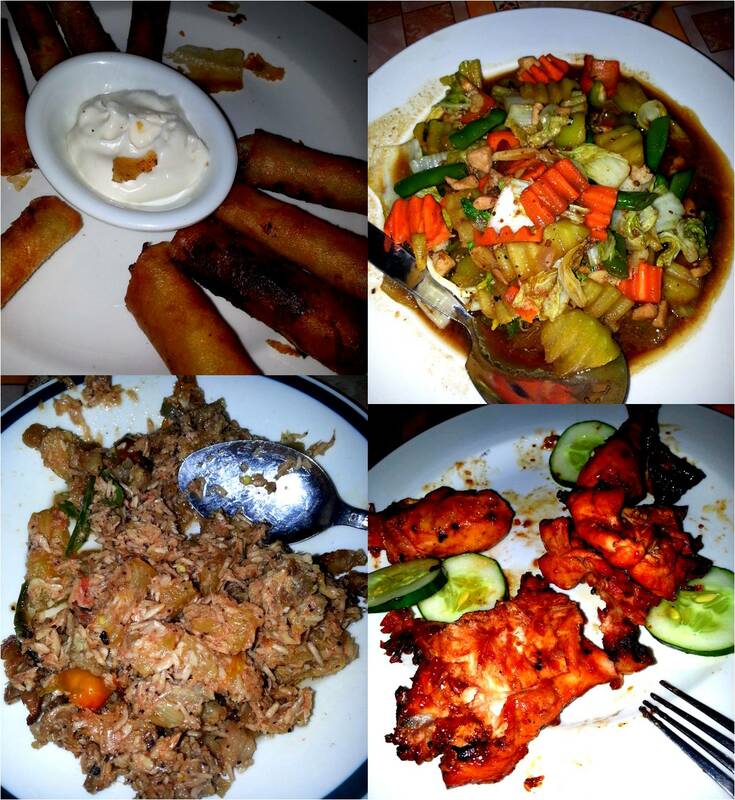 They served us Bicol Express, Chicken Inasal, Stir-Fried Mixed Veggies and Fried Fish Lumpia. A gastronomic feast indeed! After dinner, we then had our socials. They prepared Nachos and cooked their very own salsa. It was really good! Since we weren’t able to start a bonfire, we opted for a portable burner in order to cook the mallows. Another treat for everyone! The socials continued until I don’t know what time. Hi! Thanks for the very informative blog! Do you happen to have the contact details of CANDIIS ISLAND RESORT? Do you think a 60,65,67 and a 4 year old can survive Caramoan ? Yes you may contact Kuya Jovy if you want to stay at Candiis Island Resort. They should he fine as long as they are accompanied during transfer. Hi do you still have the contact details of CANDIIS ISLAND RESORT? hello! is candiis resort nice? i contacted jovy and he said rooms have air conditioner but can you please send me the pictures of the rooms? can jovy be trusted? Hi! Candiis island resort is now formally called Jasclaude Resort. For inquiries and bookings, visit us at http://www.facebook.com/JasclaudeResortCaramoan Thanks!